Hello fellow cardsmiths, I've been setting out on a journey to explore the most basic of lands. But I'm having troubles getting funds to fly first class. 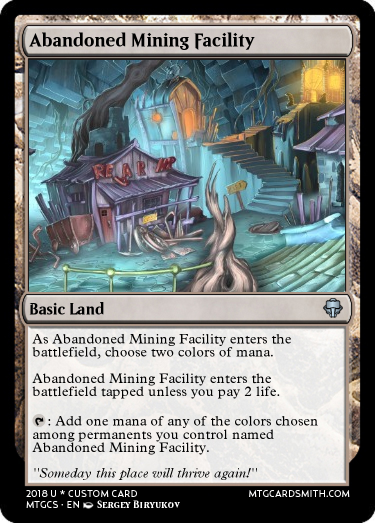 Can you help us all by posting your basic land cards? 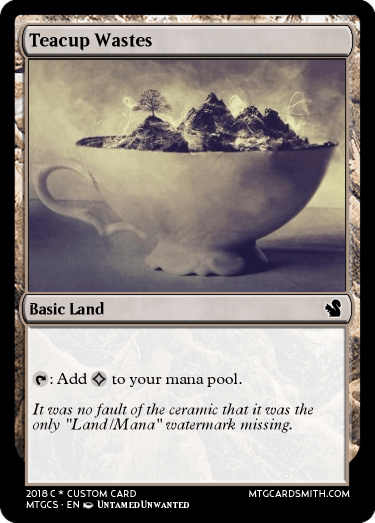 This includes remakes of existing basic lands, but isn't limited to it. Here are some places we've traveled to, on our journey so far! You can post those basic Mountains you had, here for all to see. 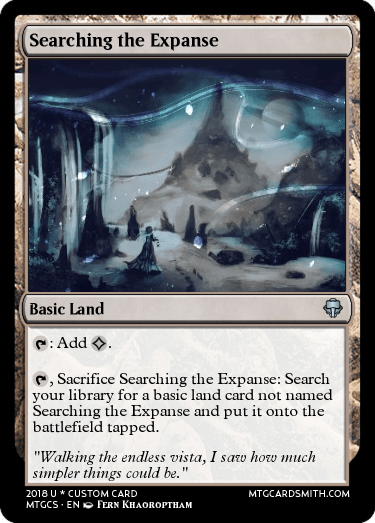 Do you have any basic lands we could explore? 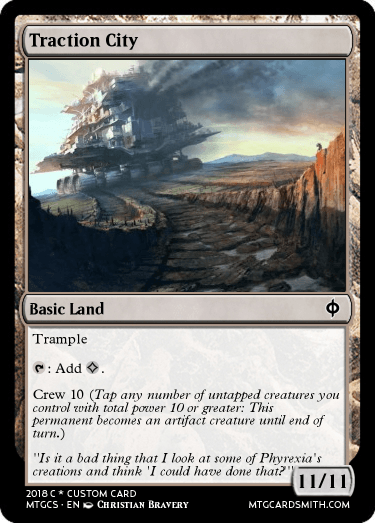 We'll also favorite all land cards that look cool! 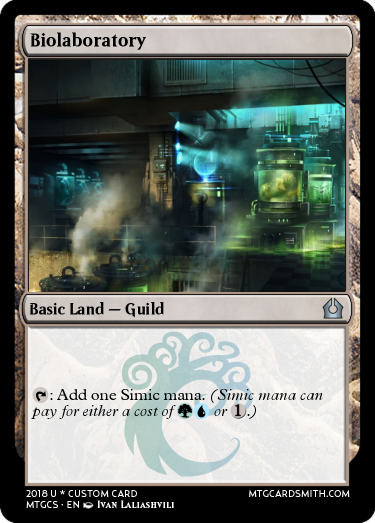 The goal is to make less simple basic lands that fulfill a purpose in deck building. Would reducing the card text on the last two change your stance a bit? What exactly will sway you? The first is as simple as it could be. I really wanted to add "Mine" subtype to Mine, but we shouldn't make Domain cards more powerful. 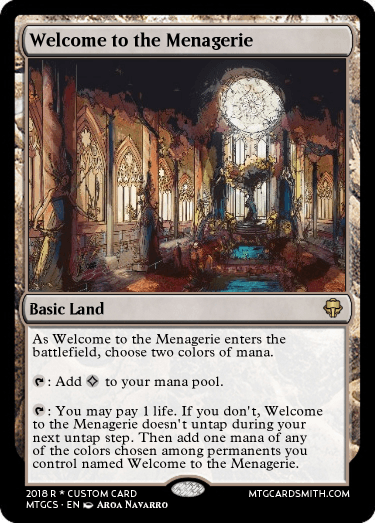 I've looked up the rules and there's no explicit rule saying that basic lands cannot have text beyond adding mana (probably because wotc isnt very likely to release a basic land other than the six), it just has to have the supertype basic. 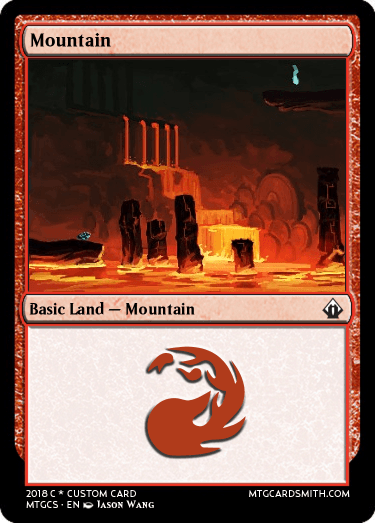 Personally, I feel that adding text to a basic land js against the spirit of what a basic land is. After all, they're meant to be just simple mana sources and adding more than that to them inherently breaks the balance of anything that tutors basic-only lands. 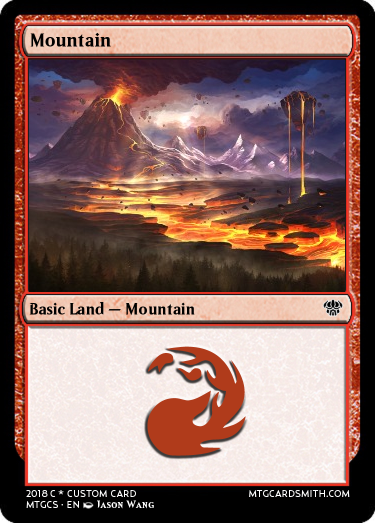 In the spirit of against wotc, I've had this idea that could be a basic land type that might be way too strong. Essentially it creates a mana that can pay for only exactly GU. It cannot pay for only G or only U, and if you try to pay for the colorless part of casting cost, it can only pay 1 of that. This means that if something costs 1G or 1U, it can only pay for the 1 part, not the full cost. What do you guys think? @fiskerton roughly summed it up. 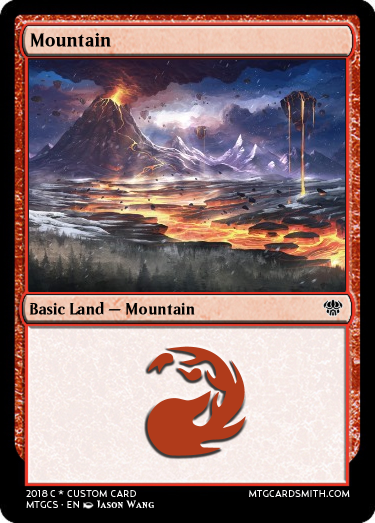 The basic lands are just that, the basics. They are often allowed to be searched for when lands with additional abilities would not, they are supposed to provide one of the 6 types of mana, enter untapped, etc. etc. I think you are just trying to make Land cards not Basic Land cards. Simplicity is of no consequence here. I will of course gladly post those mountains. @fiskerton Seems a good way to overcomplicate things even more. @murkletins, the two mountains I had talked about and just another mountain while I am at it. @Corwinnn once made a land named "Teacup Island", then people followed. ^Scroll down the page a little bit. While it really shouldn't be a basic (that's the contest's fault not yours), that is a super cool card! 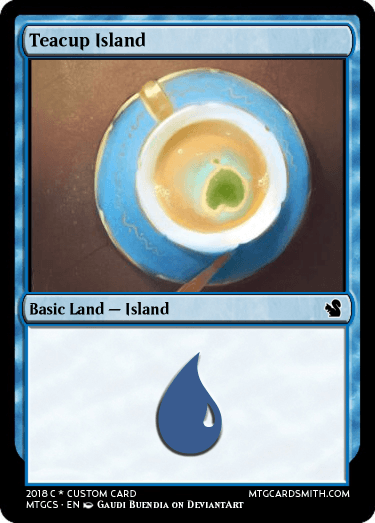 Okay, it seems people dislike the basic land cycle I've been designing for various reasons, So I'll be converting them into nonbasic lands and closing this thread.